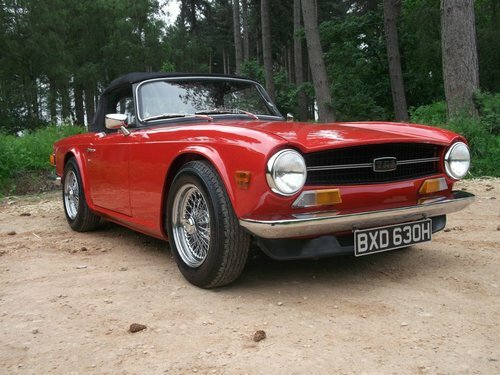 Where do we start with this remarkable Triumph TR6.. This vehicle is a genuine UK car registered 18th May 1970. TR Enterprises collected the car from a garage in Cheshire where it had sat for many years, having already been partly stripped by the previous owner. We started the build in May 2011 once a basic specification was agreed upon, this specification changed as the build progressed.. The chassis was media blasted, what came back was a very solid and straight chassis to work with. Works carried out was to replace the N/S/F lower wishbone mounting. 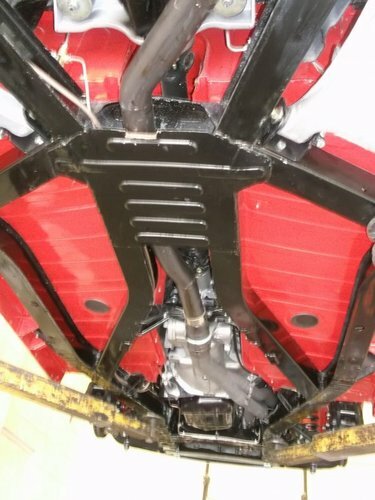 The diff pin area was strengthened along with the front wishbone mounts. The chassis was then prepped and painted in 2k gloss black. The suspension was stripped down fully, all of the suspension hardware was prepped and painted in 2k gloss black. Poly bushed throughout, new stub axles, fulcrum pins, ball joints, trunnions etc. Timken front wheel bearings with our anti knock-off kit fitted. Uprated and lowered springs all round, Koni front adjustable dampers with the rear benefiting of a Koni telescopic damper conversion at the rear. Front and rear anti-roll bars fitted. The brakes have been fully rebuilt, the front brakes have been upgraded to our AP Racing 4 pot caliper set up with vented discs, Mintex 1144 pads are fitted. The rear brakes were all new. Stainless, braided brake hoses fitted throughout. We overhauled the master cylinder and fitted a new servo. Moving on to the drivetrain, the engine was stripped and rebuilt to our ‘fast road’ specification. 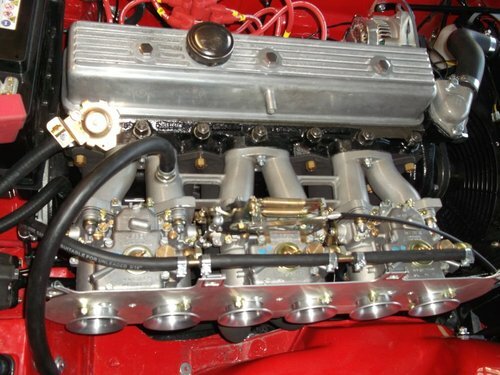 This included a lightened and balanced bottom end, oversized pistons, Piper cam, gas flowed unleaded head, race manifold with Phoenix system. Triple Weber 45 DCOE’s with ITG filter, Facet electric fuel pump with Filter king.  High torque starter motor, lightweight alternator kit. Uprated radiator with electric cooling fan. All new components used throughout. Power output appox 180 bhp. The gearbox has been fully rebuilt, using new parts as necessary. The overdrive was reconditioned and works in 2nd, 3rd and 4th. The overdrive works via a logic box. The diff was stripped and rebuilt as necessary. Uprated driveshafts and Quaife hubs are also installed. The bodyshell was media blasted, replacement floor pans, inner & outer sills, footwell side panels, boot floor, rear valance. New front outer wings along with the boot lid were also fitted. Once all the metal work was completed, the gaps were finalised and then it went into prep. The underside was stonechipped and then coloured. The top coat is Triumph Signal Red (code 32) in Lechler water base with a 2k clearcoat finish. 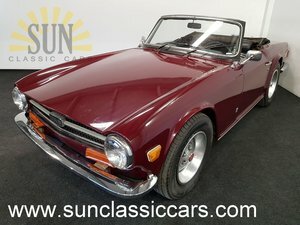 Once the car was out of the bodyshop and into the workshops, this TR6 was assembled using original reconditioned parts where possible and quality new items. 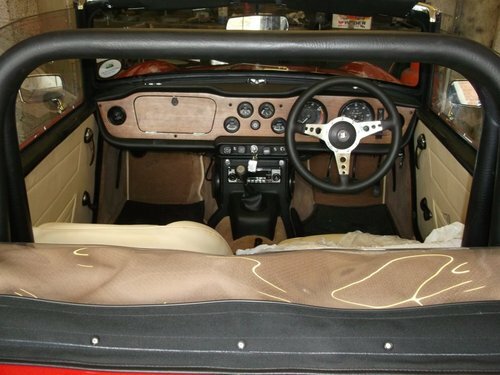 Leather seats and trim kit in Biscuit. Black mohair hood with matching hood bag. Now wiring loom, wooden dash, Mota-Lita steering wheel, heated front screen, alloy fuel tank. The original bumpers were re-chromed, 6x15? centre laced chrome wires running Avon ZZ 185/70/15 tyres. A full specification is available on request along with all the previous paperwork to show the work that has been carried out including the original build costs. When completed, we cavity waxed in all the necessary places to keep the vehicle safe and sound for the future. The vehicle was finished and on the road by May 2012 and delivered to the customer. Since the TR has been on the road, it has been maintained by TR Enterprises regardless of cost. Recently, we have installed hydraulic power steering, a fantastic modification! 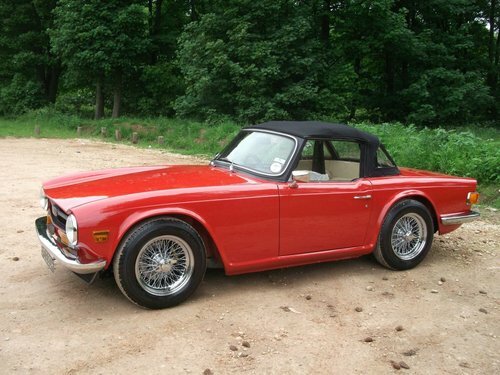 This TR6 has covered less than 2000 miles since the restoration was completed. The only reason for sale is the gentleman has a back problem and anything over 20 miles and he is in pain. It deserves to be used for what it was built for, fast road touring. 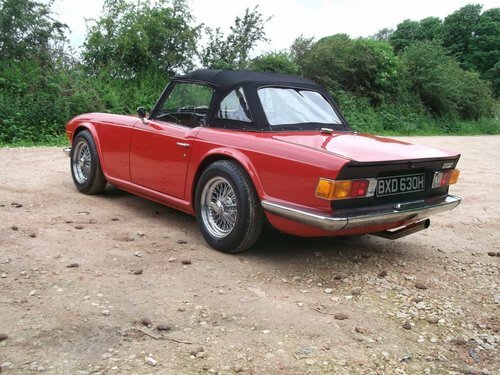 You could also enjoy track days, sprints, hillclimbs in this rather rapid TR6. Looks and drives as good as the day it was built.